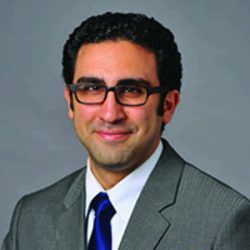 Dr. Victor Ibrahim is a board-certified specialist in physical medicine and rehabilitation and serves as the director of the Performance and Musculoskeletal Regeneration Center (PMRCenter) and team physiatrist for DC United. He graduated medical school from Case Western Reserve University, where he developed an interest for regenerative medicine while participating in groundbreaking research through the Silver Lab under the mentorship of Dr. Jerry Silver. Dr. Ibrahim completed his residency at New York Presbyterian Hospital Department of Rehabilitation and Regenerative Medicine, where he was chief resident. As part of his training, he participated in diagnostic ultrasound and orthopedic interventions at the Hospital for Special Surgery. He eventually went on to complete formal advanced training in interventional sports and spine medicine at the Medstar National Rehabilitation Hospital (NRH) in Washington, D.C., where he became the founding director of the Regeneration and Ultrasound Orthopedic Program, developing an entirely new clinical care line and establishing NRH’s first National Ultrasound Symposium. Dr. Ibrahim served as an assistant professor at Georgetown University School of Medicine and mentors many residents and students in research and career development. He has also been selected to be an instructor at the Gulf Coast Ultrasound Institute. In addition to a busy clinical practice, Dr. Ibrahim has a dedicated research interest with novel publications in autologous stem cell therapies, receiving several research awards including the Sam Schmidt Paralysis Foundation Young Investigator Award. He has published several peer reviewed articles, case reports and chapters on various musculoskeletal conditions. Dr. Ibrahim also co-authored a manual on ultrasound guided interventions. He has served as a consultant to various sports organizations including the American College of Sports Medicine, Major League Baseball, Major League Soccer, and the DC and NY Roadrunners Clubs. He has also served as an expert consultant for the Federal Government Medicare Division and The United States Bone and Joint Initiative consensus statement team.